"Buoyed by stronger same-store sales and customer traffic levels, the National Restaurant Association’s Restaurant Performance Index (RPI) topped the 100 mark in September for the first time in three months. 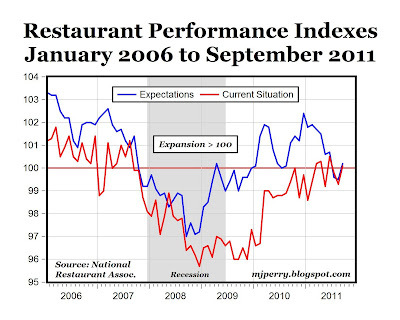 The Restaurant Performance Index consists of two components - the Current Situation Index (measuring current trends) and the Expectations Index (measuring restaurant operators’ six-month outlook) - and tracks the health of and outlook for the U.S. restaurant industry. The Current Situation Index stood at 100.1 in September – up 0.8 percent from August and the first gain in three months (see chart above). In addition, the Current Situation Index rose above 100 for the first time since June. Restaurant operators reported stronger same-store sales and customer traffic in September. Fifty percent of restaurant operators reported a same-store sales gain between September 2010 and September 2011, up from 45 percent who reported a sales gain in August. In addition, 43 percent of restaurant operators reported higher customer traffic levels between September 2010 and September 2011, while 33 percent of operators reported a traffic decline. The Expectations Index stood at 100.2 in September – up 0.7 percent from August and the strongest gain in nine months (see chart). 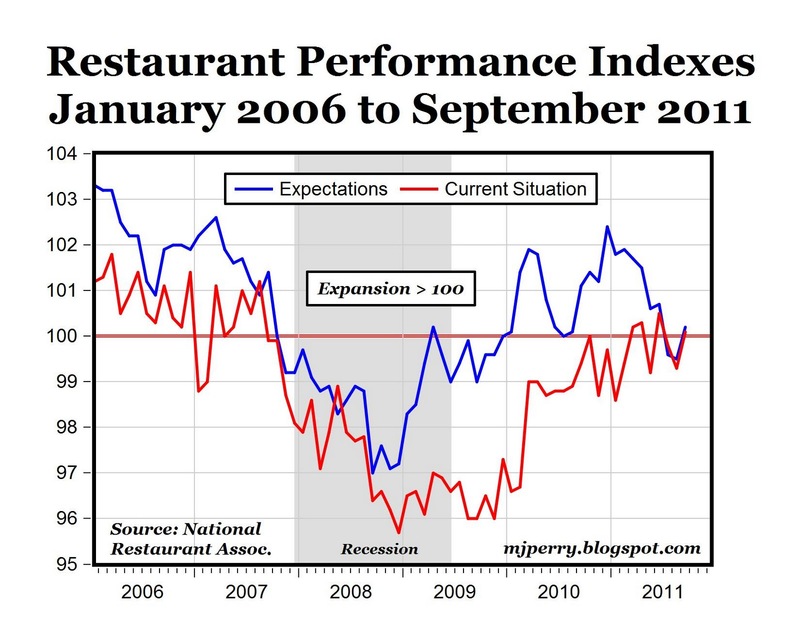 In addition, September represented the first time in three months that the Expectations Index stood above 100." Don't forget that today, Halloween, is the perfect opportunity to teach your kids an important economic lesson. is this index adjusted for inflation? i'm not so sure it's expanding in real terms. percent who reported similarly last month." This seems to align with the recent 16.3% increase in business investment, reported in BEA GDP figures. morganovich asks "is this index adjusted for inflation?". the dollar menu may still be a dollar, but it it still the same menu? my neighbor owns 8 mcdonalds franchises. i asked her about portion size and she said, oh, yeah, a big mac is TINY compared to what it used to be. we use less meat in the burgers, more filler etc. you are not getting anything like what you used to. paying the same money for less is still inflation. but most restaurants have raised prices. perhaps less so the big chains, but pretty much everyone else has been.